During an eye examination, we assess for many eye conditions ranging from dry eye to more severe conditions such as retinal detachments and age-related macular degeneration. Below is a brief overview of the main conditions we screen for. We have more detailed information available in our eye health archive. Dry eye can range from mild symptoms to very severe irritation. Patients often complain of watery, red eyes which become worse when outside in brighter light and windier conditions. 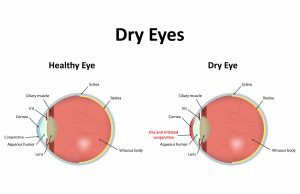 Dry eye can affect the vision by causing smeary, unstable sight where the patient feels they need to blink a lot to see clearly. Other symptoms include feeling like there is something in the eye or an intolerance to contact lens wear. We assess dry eye by assessing the quality of your tears and the condition of your eyelids and eyelashes. We check these areas by looking through a microscope under high magnification. 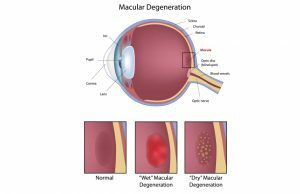 If we see that you have dry eyes there are a number of treatment options available. 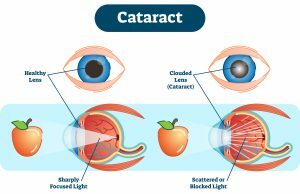 A cataract is a haziness of the natural crystalline lens of the eye which occurs over time, mainly due to age. Occasionally they can occur earlier in life or at a quicker rate. Patients generally complain of reduced vision which has gradually got worse. Vision may be more affected in certain conditions for example when driving at night, when reading or under poor light levels. If you suspect that you may have a cataract we will conduct a thorough examination and if a cataract is seen, a discussion of all your options will be had. Sometimes a simple change in prescription may be enough and an operation to remove the cataract may not be necessary. However, in the cases where an operation is advised, we will provide all the information you need. ARMD is a condition that affects the central area of vision. As the name suggests, it is associated with age. However, sometimes it occurs as a result of another eye condition. There are two types of ARMD, wet and dry. Wet ARMD tends to be the more aggressive type where patients notice a sudden drop in eyesight. It is very important to go to diagnose the patient as soon as possible. This type of ARMD is treatable, often with injections. Dry ARMD is the slowly progressive form. Patients notice a gradual deterioration in their central vision and struggle with reading initially. In later stages patients notice that they can’t recognise people’s faces as they once did. Unfortunately, this type cannot be treated but there are many ways the optometrist can help to make your eyesight more comfortable. We always assess for ARMD at every eye examination. If ARMD is detected, you would be given advice and information on the condition. If treatment is advised, all the necessary steps will be taken to take care of your eye health. 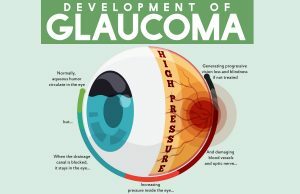 Glaucoma is damage to the optic nerve of the eye. This is a condition where the peripheral/side vision may become affected. Glaucoma is associated with age but if a family member has it, the chance of you getting it is increased. 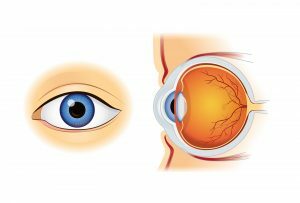 There are many types of Glaucoma but the most common form has no symptoms. That means many people are unaware that they have it. If you have a family history of Glaucoma, we recommend an eye test every 12 months. We assess for Glaucoma using a range of tests including an optic nerve assessment, intraocular pressure checks, and visual field screening. If Glaucoma is diagnosed, the treatment is to reduce the intraocular pressure in the eye. This is usually achieved via laser or eye drops. Diabetes is a condition which affects many areas of the body. However, the sensitive layer called the retina at the back of the eye contains many small blood vessels. These blood vessels may leak due to changes caused by diabetes. Patients may or may not have symptoms and this depends on which part of the retina is affected. If you have diabetes you should be seen for an eye examinaton more frequently. The longer you have the condition, the more likely you are to have diabetic retinopathy. 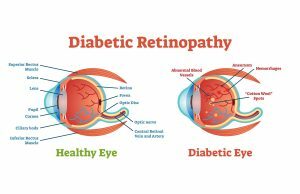 We examine for diabetic retinopathy by dilating the pupil of your eye using eye drops. Then an examination is made of your retina to detect any diabetic changes. If retinopathy is detected, a referral is made to the Gibraltar Health Authority (GHA) hospital eye service in order to be seen by their diabetic retinopathy screening programme. If urgent treatment is required, we will make arrangements for you to be seen by the GHA hospital eye service as soon as possible.